Hi guys! I was in NYC part of last week and that's why I didn't have a post up. I should have had this ready before I left...but of course I didn't. I don't know how anyone could live there. The traffic was insane and everything is just crazy. I'll take my boring NC town, I guess. 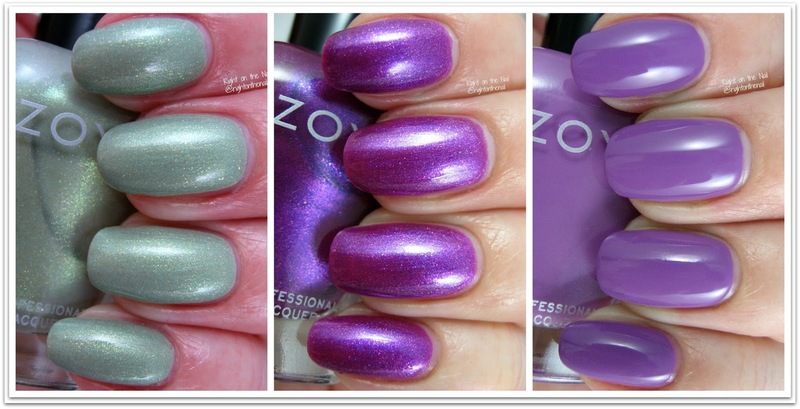 Tonight I'll be finishing up Zoya's Charming Collection which features 6 spring-inspired colors. Without further ado, let's do this! Lacey is my #1 pick from the collection and is a dusky pale green with silver shimmer and gold flakes similar to Amira. Nothing screams IT'S SPRING! like a beautiful green polish! You can see a few brushstrokes, but it's not too noticeable in real life. It applied well in 3 thin coats, but you may be able to get away with 2 on shorter nails. Millie is a violet jelly base with pink/purple and blue shimmer. The shimmer really stands out and I really like that the finish is different on this one. It looks a bit sheerer than the rest, even with 3 coats, but it's fully opaque in person. Last, but not least, we have Tina which is a medium purple crème. I really like that it's not too light or pastel. Being a little darker, I think it will work better with more skintones. That said, I think this collection is a bit purple-heavy. Tina pretty much applied itself in 2 simple coats. Good job, Zoya! Overall, I'm happy with this Zoya collection. My recommendations would be Amira and Lacey because I think they are the most unique to my collection. The cremes applied well, so if you are in the need of a new pink or purple color, I would definitely recommend those as well. Don't forget that Zoya also has the Springlettes for sale (which includes other spring-like colors). Zoya polishes retail for $10 and you can find out more about them on their website, Facebook, Twitter, or Instagram pages. Keep an eye out for them in your local Ulta store if you want to see the bottles in person before you buy.